Sen. Ann Cummings questioning Sen. Chris Bray about a proposal to ban single-use plastic bags. 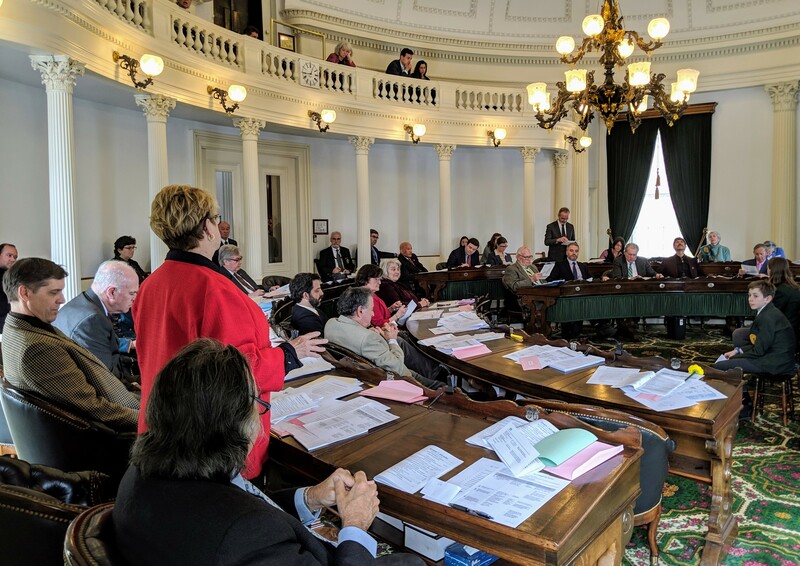 Sen. Michael Sirotkin (D-Chittenden), a cosponsor of the original legislation, said he had concerns about the 10-cent fee, which was added in committee. Bray said similar policies have proven to work in other areas that have already implemented such fees. Without giving people an incentive to stay away from paper, Bray said, the bill wouldn’t accomplish that goal as easily. “In jurisdictions where those bags were provided at no cost, many people just switched to paper, and they changed the nature of the problem, but now they have more paper waste to deal with,” Bray said. The legislation allows restaurants to distribute straws to customers who request them, and it does not ban the retail sale of straws. There’s also an exception for foam used in packaging, such as grocery store meat trays or egg cartons. Other foam containers, such as take-out trays or insulated, to-go coffee cups, would be banned by the legislation. Senate Majority Leader Becca Balint (D-Windham) lives in Brattleboro, where single-use plastic bags were banned in July 2018. She said concerns about the rollout of a statewide policy are overblown. “It was not a big deal at all,” Balint said of the Brattleboro policy. Gov. Phil Scott has signaled that he's open to a plastic bag ban. "I'm not opposed to that," Scott said at a Thursday press conference at the Statehouse. "I don't understand the 10-cent increase in other bags." Scott said retailers he speaks to are "not as much opposed as they once were" to the idea. During Friday's Senate debate, Sen. Phil Baruth (D/P-Chittenden) shared a personal anecdote about the plastic problem. He said his 14-year-old daughter became concerned about plastic waste before he did, so she began collecting plastic straws the family was given at restaurants in order to save them from the trash. After a few months of this, Baruth said, he went to clean out his car. “There were hundreds of straws that neither she nor I knew how to properly dispose of,” he said as senators laughed. In Friday’s vote, only three members — Sens. Brian Collamore (R-Rutland), James McNeil (R-Rutland) and Corey Parent (R-Franklin) — voted against the legislation. The proposal faces a final procedural vote in the Senate next week before it goes to the House for further consideration.